Is shachor (shahor) שחור - "black" related to shachar (shahar) שחר - "dawn"? The best way to tell would be to see if there are common or divergent etymologies. Klein, who tends to be more conservative in these questions, shows different derivations. Shachor, he writes, is related to Syrian שוחרא shuchra and Akkadian shuru, meaning "coal". On the other hand, shachar is related to Moabite שחרת, JAram שחרא, Arabic sahar, Akkadian sheru and shirtu - all meaning "dawn". Steinberg also provides different etymologies. He writes that shachar is related to צחר, צהר and זהר - all meaning "to shine", whereas shachor is the Shaph'el form of חרה - "to burn". For an example, he writes that the Targum for Iyov 30:30 offers שחם for שחר - also Shaph'el of חם, "to be warm". However, there are those that disagree, and find a connection. Almagor-Ramon writes that there is a phenomenon in Hebrew and other languages, where when there is a root that has words which approach the limit of that meaning, from that limit they have a tendency to switch meanings. For an example, she writes that at night, everything is black (shachor), and toward the end of the night, on the limit, when there is already more light than black, we still refer to that period as shachar - dawn. This concept is used in word games called "synonym chains" as described here. It even goes so far as to suggest that the expression "It is always darkest before the dawn" has its origins in the connection between shachar and shachor. Curiously, even Klein gives three definitions to shachar: 1) dawn, 2) daybreak 3) the blackness preceding the dawn (emphasis mine). Probably derived from שחר ( = dawn), whence arose the meaning 'to rise early in the morning; to go out early in the morning and seek', whence 'to turn toward'. Jastrow offers "to break through, dig, to search, seek" - and from here to the break of dawn. Other derivatives of shachar are shacharit שחרית (the time of, and the name of the morning prayer) and shocher שוחר - a fan, a friend, as in שוחר שלום - "a lover of peace". Shachar can also mean "meaning, sense, significance". This derives from Yeshayahu 8:20 - אֲשֶׁר אֵין-לוֹ שָׁחַר - which literally meant "with no dawn", for no light will be shone upon it. Today the expression often refers to rumors "that have no foundation". Whether or not shachar and shachor are connected, there is one word that people derive from one or the other. In Kohelet 11:10, we find the pairing of הַיַּלְדוּת וְהַשַּׁחֲרוּת - childhood and youth (shacharut). Ibn Ezra connects shacharut to dawn, the beginning of a person's life. The Targum indicates that shacharut means youth due to the darkness of hair (יומי דאוכמות שער). As we've done with the other colors, we should also ask: does shachor only mean black? Kaddari writes that there are times when shachor means the color black (VaYikra 13:31), and other times where it means "dark" (Shir HaShirim 1:5-6). 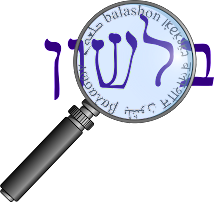 In Modern Hebrew slang, shachor can refer to the Haredim, the black market, and members of the Tank Corp in the army.